Wassily Wassilyevich Kandinsky was a Russian painter, and Art theorist. He is credited with painting the first modern abstract works. In 1896 he settled in Munich and studied first in the private school of Anton Ažbe and then at the Academy of Fine Arts, Munich. He went back to Moscow in 1914 after World War I started. He was unsympathetic to the official theories on art in Moscow and returned to Germany in 1921. 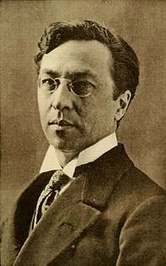 T Wassily Wassilyevich Kandinsky was a Russian painter, and Art theorist. He is credited with painting the first modern abstract works.